Yoshu Yasu Suzuku, Generative Systems, School of the Art Institute of Chicago, c.1970-1976, 1 slide: col.; 35 mm. The Daniel Langlois Foundation for Art, Science, and Technology, Sonia Landy Sheridan fonds. 0501-110. 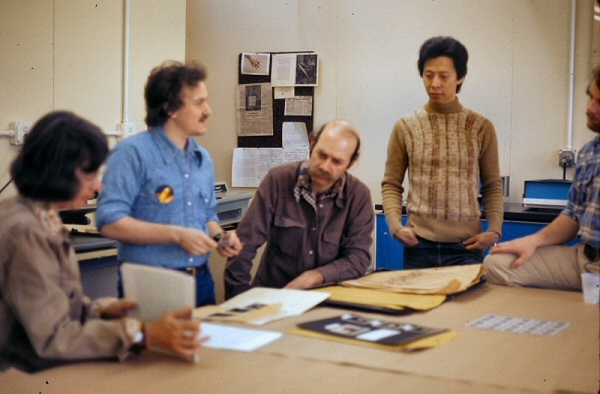 Mitch Petchnick (blue shirt), Generative Systems, School of the Art Institute of Chicago, c.1976, 1 slide: col.; 35 mm. The Daniel Langlois Foundation for Art, Science, and Technology, Sonia Landy Sheridan fonds. 0501-110.